Finally a mop that cleans every floor perfectly, whether wet or merely damp. The mop has a rotating mechanism in the handle that you to control the mop’s moisture content, solely by movement of the handle. Simply place the microfibre mop head inside the tumbler, press down gently and the dirt is spun off into the bucket along with the water. The rapid rotation of the mop is achieved solely by the movement of the patented handle. This allows the moisture content of the powerful microfibres to be precisely controlled. Press and rotate four times for tiles, six times for wood, parquet or laminate. The Clean Twist Disc Mop Active’s rotating mechanism can be operated using just one hand — no balancing, bending over or hands in dirty water. If a short break from cleaning is needed, the Clean Twist Disc Mop Active just stops on the spot — thanks to its standing function, it can be stored anywhere with no need to lean against a wall. In use, its enormously absorbent microfibres remove dirt, hair and dust thoroughly and effortlessly. To ensure the fibres can reach dirt under low furniture and in hard-to-reach corners, the mop’s head is able to swivel up to 180°. Leifheit has also designed the mop to be back-friendly — the telescopic handle can be extended to match your height within a range of 104 cm to 130 cm. The Leifheit Clean Twist Disc Mop Active is available as a handy set complete with mop and telescopic handle, tumbler and 15 litre bucket with spout. 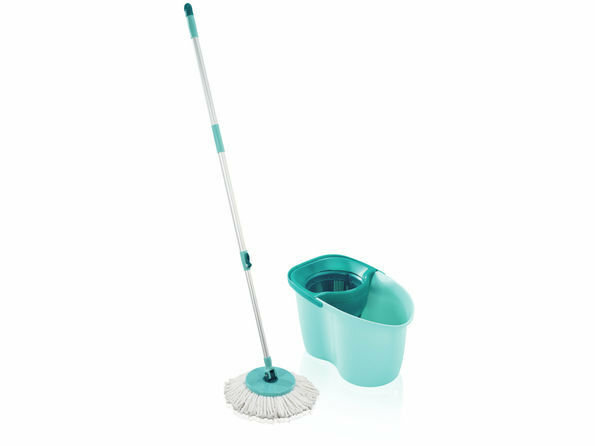 The microfibre mop head is easily replaceable and washable at 60°C.